OAs’ victory has given them hope of avoiding the drop and it was a double success for Gavin Hogg’s side in Round 23 as rivals Loughborough Students and Hull Ionians could not be separated in the Midlands. It means Hull stay four points behind 13th placed Loughborough whilst bottom of the table Fylde suffered a defeat against Birmingham Moseley as they edge closer to the trapdoor. At the right end of the table, league leaders Coventry are now 21 points clear at the summit after a comfortable win over Cambridge, but also because second placed Darlington Mowden Park lost at Plymouth Albion. Cov take on Mowden Park in the final weekend of the month which could see the table toppers take a huge step towards the Championship. Elsewhere, Ampthill and District returned to winning ways against Caldy and Blackheath edged out Esher while Old Elthamians saw off the challenge of Rosslyn Park. Coventry continued their march towards the National One title with a bonus-point win over Cambridge. The home side made a scintillating start as Tom Jubb and Rob Knox both scored to put the hosts 14-3 up inside the opening 10 minutes. Jubb went over again in the first period, but Cambridge rallied as George Bretag-Norris crossed to narrow the gap just before half-time. But the home side continued to impress as Knox and Luke Narraway dotted down for second-half scores before Rowland Winter’s side completed their 21st victory of the season with a penalty try. Darlington Mowden Park are now 21 points behind league leaders Coventry after they suffered a defeat against Plymouth Albion at Brickfields. The visitors knew catching Cov would be a tough challenge, but this loss against fourth placed Albion leaves them with a lot of work to do. This encounter was level at 7-7 at the break as Adam Brocklebank’s try was cancelled out by a score from Matt Crosscombe. But, two Ed Holmes tries plus scores from Setareki Raumakita and Jack Owlett secured the bonus point win for Plymouth. Gary Law and Ben Frankland crossed for DMP, but it wasn’t enough as their 10 match unbeaten run came to an end. Ampthill and District bounced back from their defeat to Cambridge by putting Caldy to the sword at Dillingham Park. Their attacking intent was clear from the beginning as James Fish was sent in for a try after just two minutes. Syd Blackmore exploited the blindside to run in Ampthill’s second and a score plus two penalties from James Pritchard gave the hosts a 25-6 lead at half-time. Caldy managed a consolation Nick Royle try on 76 minutes, but the home side had the final say as Billy Johnson dotted down to seal the win. Fly-half Joe Tarrant guided Blackheath to a bonus-point win as they edged out Esher in an enthralling National One clash. Tarrant’s initial break set up the opening score for Geoff Griffiths, but Esher reacted almost instantly as Andy Garner touched down. The same scenario occurred later in the half as Mark Cooke’s score was cancelled out by an Esher penalty try and despite Tarrant knocking over a penalty for Blackheath; it was the visitors who led 21-17 at the break as Caden Murley went over. Esher were awarded a second penalty try after the interval, but the introduction of replacements gave ‘Club’ more impetus which led to Tarrant squeezing over to make it 28-22. And it was the fly-half who had the final say as he kept his cool to slot over the extras after Alex Pickersgill’s late score. Old Elthamians were able to hold off a spirted Rosslyn Park comeback to seal victory at the Rock. After Lewis Brown cancelled out Oli Groves’ early penalty, the visitors led 36-8 at the start of the second period thanks to tries from Ben King, Max Wilkins, Dom Lespierre, James Golledge and Freddie Hosking. Full-time – Rosslyn Park 29 Old Elthamians 36. What a cracking game and a credit to both sides. Andrew Henderson had gone over in the first 40 for the hosts and they began mounting a fightback when Oliver Hassel-Collins crossed on 54 minutes. Hugo Ellis and Dan Barnes then went over to set-up a tense final 10 minutes, but OEs were able to hold on to secure their fifth away win of the term. Fylde are now 24 points from safety in National One with seven games left to play after a brave defeat against a Birmingham Moseley outfit who were reduced to 14-men in the first period. Jacques Le Roux’s try put Moseley ahead and he grabbed his second score shortly after, but Tim Molenaar was shown a straight red-card for a tip tackle. However, despite Fylde having the extra man, Moseley were able to increase their lead before half-time as Adam Caves crashed over. Le Roux completed his hat-trick after the interval, but Fylde sparked into life with tries from Alex Dolly and Connor Wilkinson to give them hope in this contest. However, Sam Hollingsworth went over to secure the bonus point for the hosts which took the wind out of Fylde’s sails even though Ben Gregory clinched a third try of the afternoon for the visitors. 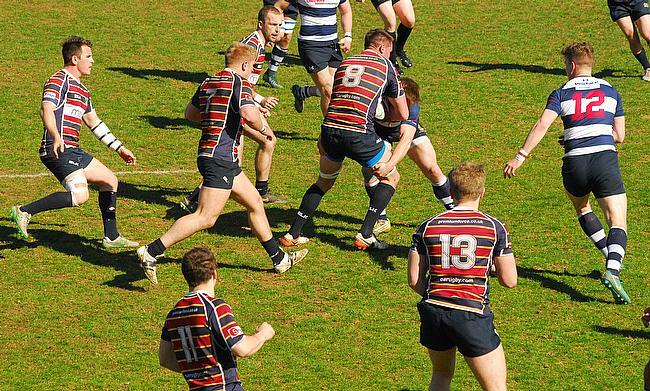 Old Albanian clinched a crucial victory in their fight for survival as they beat Bishop’s Stortford at Woollams. OA’s crossed on six occasions, with a couple of tries coming from Tadgh McElroy and Reuben Bird-Tulloch, as Gavin Hogg’s side secured the win which leaves them 10 points from safety. An injury hit Stortford found themselves 14-0 down after 10 minutes and they did fightback through Will Roberts and Ryan Hutler, but that was as good as it got for Andy Long’s men. Theo Vukasinovic’s late try kept Loughborough Students four points clear of the relegation places after this draw with rivals Hull Ionians. The result keeps the Midlands side ahead of the bottom three with eight games remaining in their season, whilst Hull Ionians are still a place behind the Students after seeing a victory slip away from them. Chris Bell’s penalty and a try from Sam Wilson had given the I’s the lead at the break, with Owen Waters responding from the tee for the visitors. Loughborough then went ahead after the restart as Owen Hills barged over, but the home side were on course to secure a vital victory when Lewis Minikin touched down. However, the Students battled back and with two minutes left, Vukasinovic dotted down to clinch a share of the spoils.